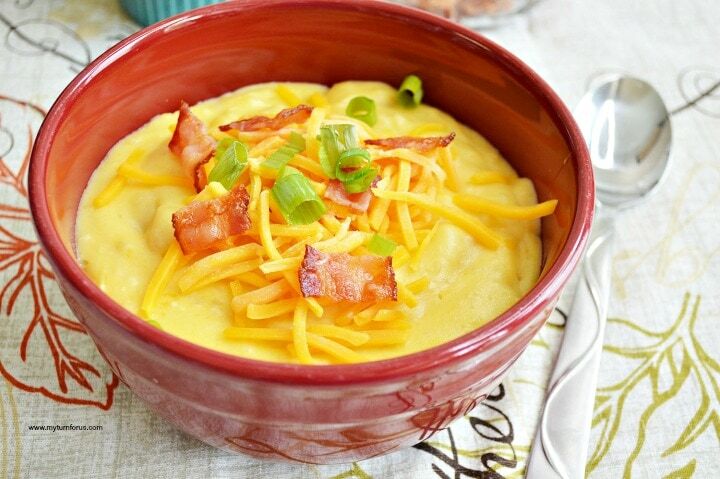 This is a Cheesy potato soup recipe that is served topped with bacon and cheese. 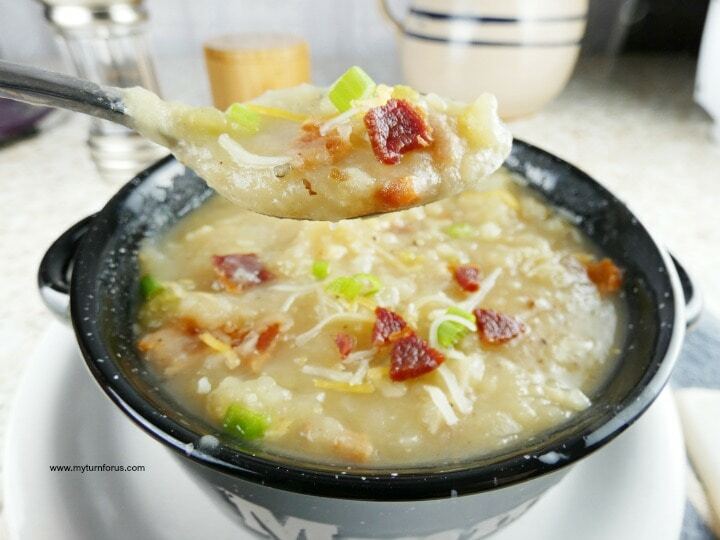 It’s a super delicious cheesy slow cooker potato soup. 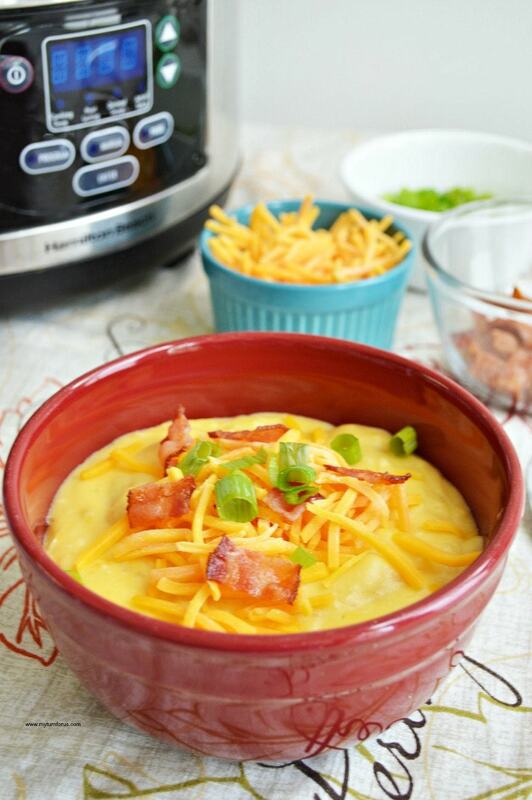 This Crockpot potato soup is a Campbells cheddar cheese soup recipe. Most of the time we try to use fresh ingredients in our recipes. But since canned cream soups are so incredibly loaded with flavor, we can’t dismiss them. They rock so much flavor and we make sure we always have a few in the pantry at all times. 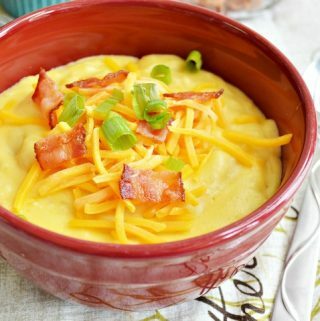 There are so many Campbells cheddar cheese soup recipes, but this crockpot potato soup is one of our favorites. 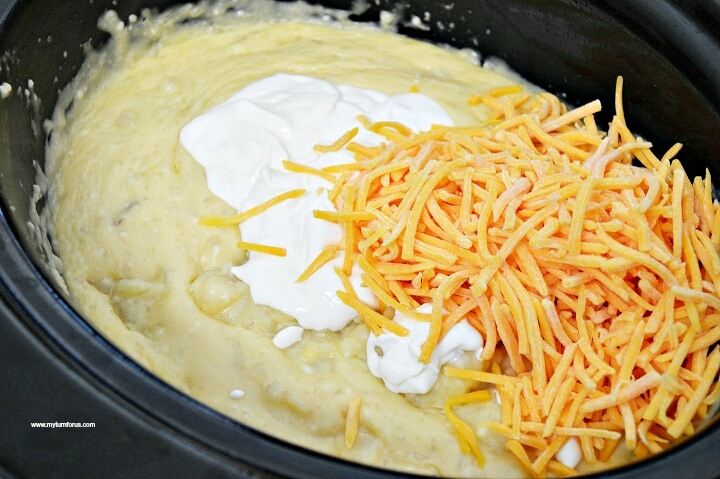 We make this easy cheesy potato soup recipe in a crockpot using fresh ingredients. And then we added a can of cheddar cheese soup to our crockpot potato soup for added flavor. 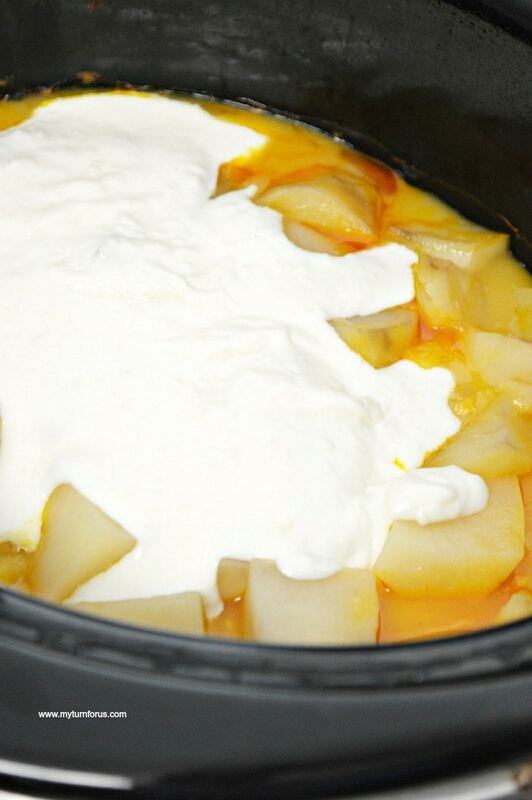 Crockpots or slow cookers are such a help in a busy kitchen. It makes the day so less stressful knowing you have a delicious meal cooking away while you are busy with other duties. Start your slow cooker potato soup or crockpot potato soup by adding chicken broth, cream of cheddar soup, potatoes, onion, garlic, salt, and pepper. Cook on low for 4-6 hours or 3-31/2 hours on high. Thirty minutes before the end time, use a potato masher to mash up about one half the cooked potato mixture. In a medium saucepan, melt butter and after butter is melted whisk in flour. Then whisk in half and half and cook on medium heat frequently stirring until mixture begins to thicken. Add to the crockpot potato soup and stir well. Add sour cream and cheddar cheese to the soup mixture. 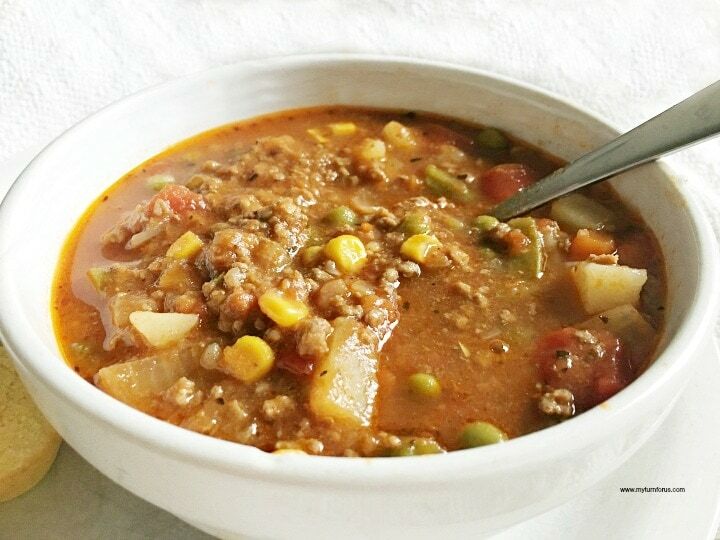 Stir occasionally during the last 30 minutes to fully incorporate all ingredients. 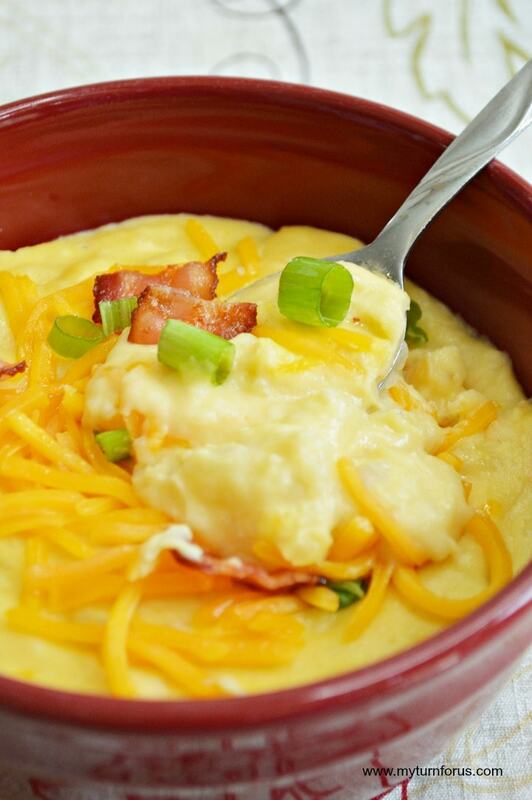 Serve topped with additional cheddar cheese, green onions and chopped bacon. 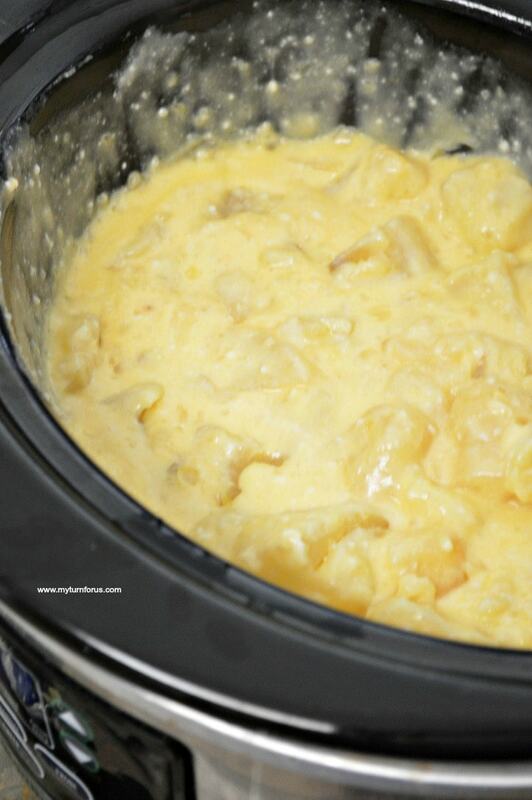 In your crockpot, add chicken broth, cheddar cheese soup, potatoes, onion, garlic, salt, and pepper. Stir to combine. Cook on low, 4-6 hours, or 3-3 ½ hours on high. 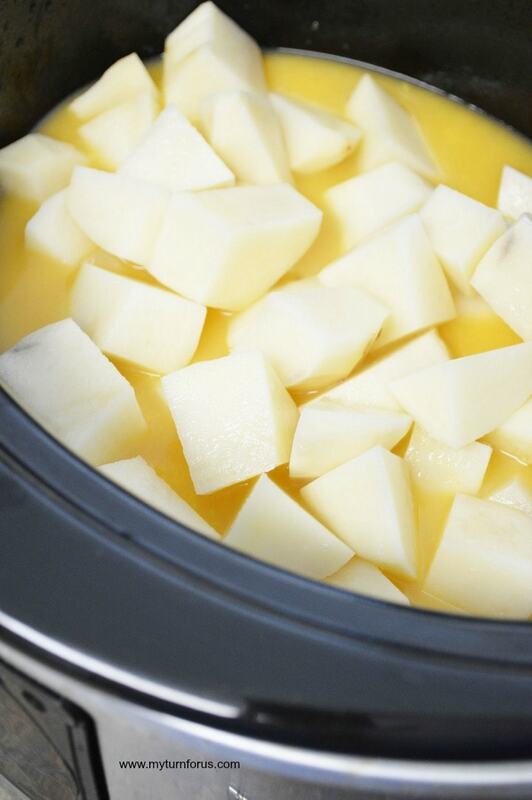 Once there are 30 minutes left on your cook time, use a potato masher to mash up about ½ of the potatoes in the crockpot. Then, in a medium-sized saucepan, melt butter. Once butter is melted, slowly whisk in flour. Then, whisk in half and half. Cook on medium heat, stirring frequently until mixture begins to thicken. Add half and half mixture to the crockpot. Also, stir in sour cream and 1 cup shredded cheddar cheese. Stir occasionally during the last 30 minutes of cook time to incorporate all the ingredients. Once finished, serve warm and top with extra shredded cheese, bacon, and green onions.